Jon Washburn: Noel Sing We! The Phoenix Bach Choir, regarded as one of the finest professional choral ensembles in America, is rapidly increasing its national and international presence. The Choir's musical offerings inspire, entertain and educate audiences and have earned the group a stellar reputation recognized by local, national and international critics. The Choir is equally dedicated to commissioning, performing and recording exciting new music as well as informed and sensitive presentation of traditional masterworks. The Choir has been the featured choral ensemble at numerous regional choral conventions of the American Choral Directors Association, performing in Honolulu, Houston, Indianapolis and in 2006, Salt Lake City. In March of 2003, the Choir performed the West Coast premiere of Daniel Lentz' Café Desire before a capacity crowd in San Francisco as part of the Other Minds 9 new music festival and has performed for Arch-Bishop Emeritus of South Africa, Desmond Tutu and the Governor of Arizona. The Phoenix Bach Choir is the first North American Choir to have an album on Chandos, the world's largest independent classical record label. Audiences around the country have been treated to the sounds of the Phoenix Bach Choir through broadcasts on National Public Radio's Performance Today as well as features on NPR affiliated stations including WFMT (Chicago) and WGBH (Boston) and around the globe including BBC Radio 3 and Classic FM in the U.K., and ABC radio - Australia. Its Shakespeare In Song recording has garnered world-wide praise. Eternal Rest, the Choir's second disc on Chandos is scheduled for release in the fall of 2007. Featuring Frank Martin's Mass for Double Chorus, Eternal Rest was recorded with the Kansas City Chorale. In addition to performances, touring and recordings, the choir is active in schools around the greater Phoenix area, providing its Bach to School educational outreach programs for which it received a nomination for the best emerging education outreach program by Chorus America. Milagros de Navidad (The Miracle of Christmas) is a set of traditional carols for choir, guitar and percussion adapted by Ed Henderson for this recording from earlier settings for the Latin American ensemble Ancient Cultures. Henderson is a composer, arranger, conductor and guitarist from Vancouver, Canada. Noel Sing We! was composed in 1993 for the Phoenix Bach Choir to perform with Native American Flutist Robert Tree Cody. The Native American flute is an evocative instrument whose history and use are traced back generations through oral history. Each flute is a personal, handcrafted instrument, the tuning and scale depending upon the particular choices of the maker. Though lacking the full chromaticism of the diatonic scale, it is similar in range, timbre and simplicity to that of medieval European wind instruments, which inspired Jon Washburn to investigate carol texts of the Middle Ages. The three ancient noel texts, which come from old English manuscripts, have been subjected to considerable alteration and fitted out with original tunes. Chant interludes, which separate the three noels, have a text drawn from the same sources, sung once in Latin and then again in English. The idea for the music was not to consciously write in either native or choral idioms but to simply follow the lead of the texts and let the "influences" fall as they may. Hernando Franco was chapel master of the Mexico City Cathedral in the late 16th century. Born in Spain, his style reflects that of Spanish masters such as Morales and Victoria. The Magnificat secundi toni is one of the many found in an old Mexican manuscript now called the Franco Codex. It is sung in responsorial fashion typical of this period, with the verses alternating between plainsong and polyphony. Lo, how a rose e'er blooming is based on a traditional carol and a long-loved translation of the text by Theodore Baker. It was composed for the Phoenix Bach Choir in 1994 by Jon Washburn. The Star was composed for the Vancouver Chamber Choir in 1979. It is a miniature Christmas scene centered on Carl Sandburg's magnificent poem Special Starlight, which is presented as a narration. The reading is accompanied by three "star" songs that seem to naturally fit the shifting moods of the poem. The Phoenix Bach Choir's name honors the great German composer Johann Sebastian Bach (1685-1750.) Weihnachtslieder, a set of small pieces and chorales is drawn from various larger Bach works appropriate to Christmas. 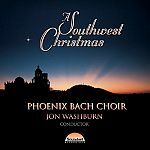 "The Phoenix Bach Choir four years ago premiered Milagros de Navidad, a Christmas cycle for choir, guitar and percussion by Ed Henderson, as a way of marking the holiday season in a Southwestern accent. This year, the choir has made Milagros the lead item in a superbly produced and packaged yuletide CD from an emerging Arizona label, Soundset. Jon Washburn conducts the ensemble of Frank Koonce, guitar; Mark Sunkett, percussion; and the choir with select soloists." "In this sonically clean and vibrant recording, Milagros is a compendium of yuletide songs lovingly sung in Spanish and English, with running commentary from guitarist Koonce. Robert Tree Cody, on Native American Flute (the instrument of choice this season, it seems), is also heard here, in Washburn's own Noel Sing We, a kind of American Indian-haunted holiday landscape."